DeMolay International is once again hosting an International Chapter Challenge Bowling Tournament for all of DeMolay. All teams must bowl between February 1, 2018 through March 31, 2018. Scores submitted that were bowled during another time period will not be accepted. All report forms must be submitted by April 15, 2018. Ten pin bowling only (no handicaps). A Chapter may enter more than one team; however, each bowler may compete on only one team. A team may enter only once. Each member must bowl three games with the team, and each member must be an active member in good standing with DeMolay. The members of the team must be decided before competition play begins. 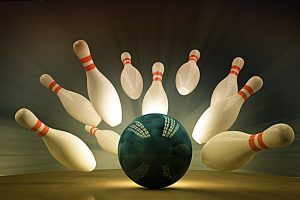 Bowlers are allowed practice; however, a team must decide that it is beginning a competition game before the first frame is bowled. (You cannot list the best five players out of ten, or the best three games out of five, etc.) Awards will be given in the following categories: Individual High Game, Individual High Series, Regional High Team Series, and International High Team Series. For more information and to submit your payment and scores, please visit: DeMolay.org/bowling.